We have been dog owners all our lives ! For over the last 30 years, we have owned loved showed and selectively bred dogs (including French Champion, ranged 3rd and 4th Open Class at the National Breed Club Show, CACS, BOS…). I bought my first pedigree Show Dog, a Great Dane, in 1987 (my oldest son Matthieu stills breeds them). 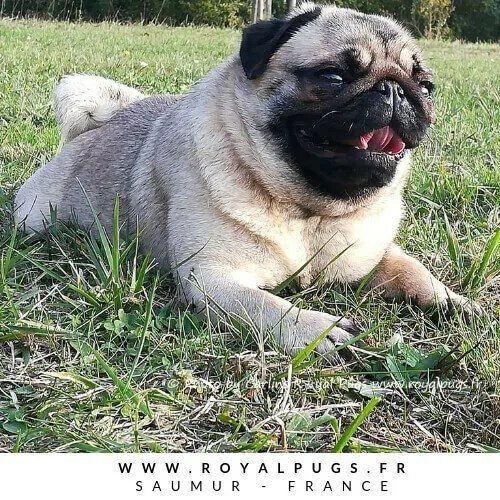 Royal As A Pug FCI Kennel #89205 is a small family Kennel Club Registered Pug Kennel #494085 (only one litter a year) located in the countryside of Anjou, Loire Valley, France. Our Pugs are first Family Members, they live as beloved family pets in a busy loving home with our children, sharing every days of the family life. Find Quality Pedigree Pug Puppies for Sale ? All our Pug Puppies are borned and raised in family home, and ready to go to their forever families at the age of 10 weeks, micro chipped, all vaccinated, vet passeport, wormed, with a 5 generations pedigree FCI -KC registered. Pug dogs and kc Puppies shipping is available to any state in USA or worldwide (must arrange it with us, export in accordance with the Customs Regulations). Current Litter of Pug Puppies borned on 4th Decembrer 2018 (KC reg 2018045438-2018-1). Ready to go 11th February 2019. Our beloved Pug LINE CELEBRITIES COCO CHANEL « CHANY » (CH Beauty Flowers Abervil × CH Beauty Flowers Grezy Nochi) gived birth to a stunning self whelped Pug Puppies litter of 6, sired by Multi Champion TANGETOPPEN’S TAKE A HINT « TINO » (CH Los Chatos del Turia I Spy Tangetoppen × CH Tangetoppen’s Annie Get Your Gun) Crufts 2016 1st Limit Dog, UK Champion, Dutch Champion, and Res Best Male European Dog Show 2016 Breeder: Ms E. Juverud at KENNEL TANGETOPPEN – maybe the #1 Pug Kennel in the all World – Owner: our Friend honorable Ms J. Ashton at ZOBEAR Show Kennels. Both parents health tested and DNA profiled. Fawn Puppies available to 5 Star Homes only : Please note that only for ever loving homes will be considered before beginning the adoption process. For further informations about Parents, Health tests and Show Results, current litter, our breeding program and planned 2019 pug litter, available Pug Puppies for sale, please feel free to contact Philippe or Tel (during 9am – 6pm (GMT) Monday to Friday): +(33) 6 1730 6964. Puppies will be endorsed not for breeding by contract, until fully health tested. 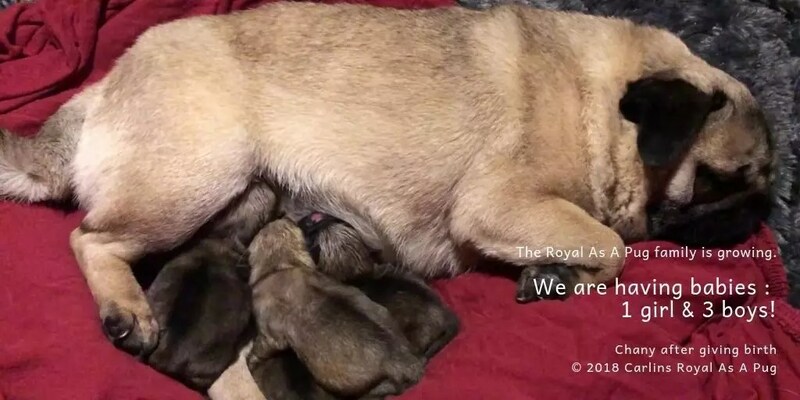 Your Pug Puppies will not be available for visits until they are 5 weeks old (videos and pictures can be seen via our FaceBook and WebSite) and will not be released to their new homes until they are 10 weeks old. Royal As Pug FCI Kennel is currently Proud Member of the Pug Dog Club of England as well as the French Pug Breed Club C.F.B.T.C.& P.B.